« Ginger Made: The “Ladies Who Lunch… and Also Party” Two-Piece Dress! Ewww, I know what you mean! 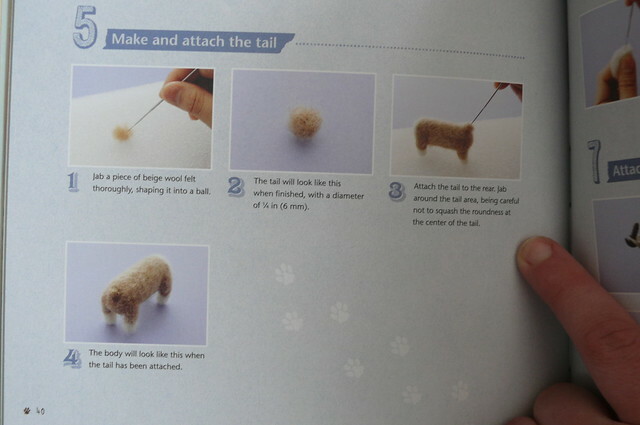 The crafting with cat hair book really gives me the willies. I definitely won’t be collecting any pug fur for this (although I certainly could… they shed like crazy)! A sweater out of pug fur doesn’t sound fun. But I have two Newfoundlands and they are super soft, angora bunny soft; so I don’t think a sweater would be too bad. I am pretty partial to brown newfies; however, on the small dog spectrum, I have a serious weakness for pug-beagle mixes (puggles). I love most dogs, but my husband is partial to Huskies and Corgis so I’m sure we’ll get one of them some day. We did go and play with a Golden Retriever puppy the other day and that was SO MUCH fun. Our apartment isn’t very pet friendly so we’re waiting until we get a house, but it’s a tough wait! wow, what an awesome book! The red dog looks a little like my red heeler, Lucy, and also my favorite breed: the Australian Cattle Dog! 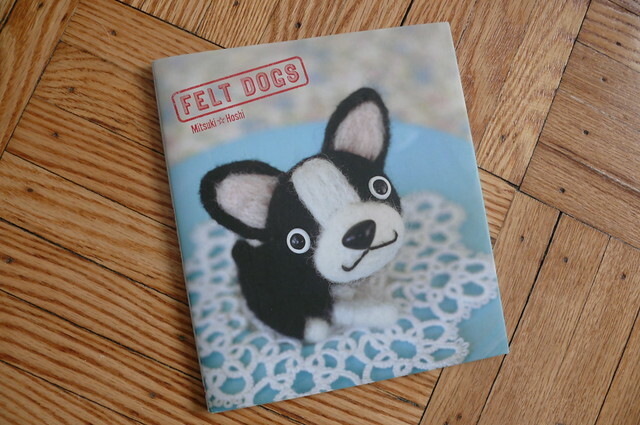 I’m impressed with how distinctive each breed looks made-up in felt–very cool! My favorite dog is a scottie dog! They are so cute! My sister does needles felting and is pretty good at it. She’d really like this book, especially since it is in English. I love crafts and dogs! How cute are they! Looks tricky – Thanks for the giveaway! Oh, and I love JRT type breeds and chihuahuas are growing on me as I have a small one! I’m a sucker for both felting and adorable doggies! My favorite breed is probably boston terriers, or pugs, or other smush face dogs. Love! I am not a dog person, but if I were to have a dog, it would be a greyhound (two, preferably; they are so Art Deco) and PUGS. I LOVE pugs! (not the super-bulgy-eyed inbred looking ones, though!) Your little fella there is so cute! 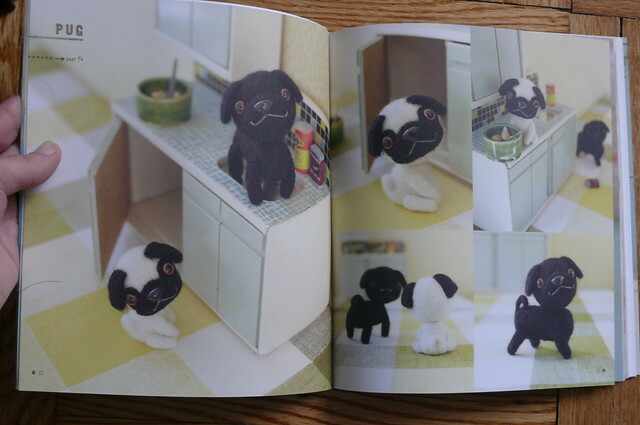 (I PREFER black in both cats and dogs) These felt dogs are cute but I have a friend who makes up felt dogs that look REAL. And what’s the problem with using an animals own fur to felt with? I use my cat’s own fur collected from the brush to stuff the toys I make for her; that way i know she’s not getting anything toxic or unhealthy. Why NOT supplement that expensive roving with a renewable FREE resource? I wouldn’t recommend this for anything I was making to SELL, however! So much cute! I love King Charles spaniels. Oh how adorable! I was in a local fabric store (Nashville, TN) today and they had a basket of felted Easter bunnies, with a sign up sheet to enroll in a class! I was tempted, though I usually stick to dressmaking! Still, I’m up for it! Enter me in the drawing! Oh, and though my overall attitude about dogs is to love the one you’re with, I have to admit my favorite breed is the Saint Bernard. I’ve had two – Webster and Bogart. They were goofy and sweet and I miss them every day. By the way, I’ve been loving your blog lately. Especially the Flora dress! Inspiring!!! They are really cute! So is your’s! I know nothing about felting and I would probably injure myself doing it, so don’t worry about entering me in the draw. I just wanted to say how cute they both are! Yes, enter me into this contest please! My favorite dog is a Dalmation because I used to have one! Please enter me in this contest. My daughter would love this. K.C. Spaniels are her favorite dogs to. My 11 year old would go nuts over this! I am currently sharing the couch with our two mutts – springer spaniel mix and a boxer mix. Love ’em all! Please enter me in the contest! My favorite dog is a yorkie! I’m also partial to really ugly mutts . Hilarious! and so so so cute! did you make any? If I made one, I think my dogs would be upset that they aren’t the cutest in the house anymore. Stinkin’ cute Ginger! I would love to be in the drawing, and hope they feature my favorite French bulldogs! Wow. Too cute for words! This is not an entry, because I wouldn’t be able to try this craft. You know, wool. But that is really cute! My family had herding-type dogs most of the time I was living there, and so I’m a bit partial to German shepherds in particular. Though we currently have golden retrievers, since my husband had 2 already when I met him. They’re sweet, but sometimes very destructive when neither of us are home! This is adorable! My mum recently managed to needle felt a fairly successful sheep. She gave it to my cat, who has taken a surprisingly long time to dismantle it – we’re currently down to one leg. I reckon he’d make much faster work of a doggy, though. Your Pug is adorable! 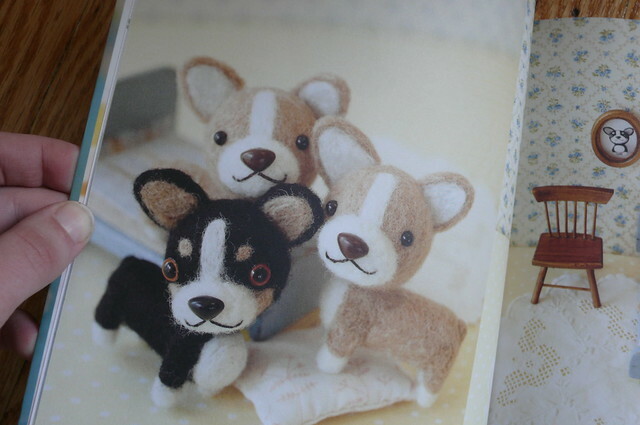 I have two myself and would love to make a felt Pug and a Corgi for my sister. That’s. Just. Great. Now I have to add yet one more craft thing to my list. I need a 12-step program for crafters. 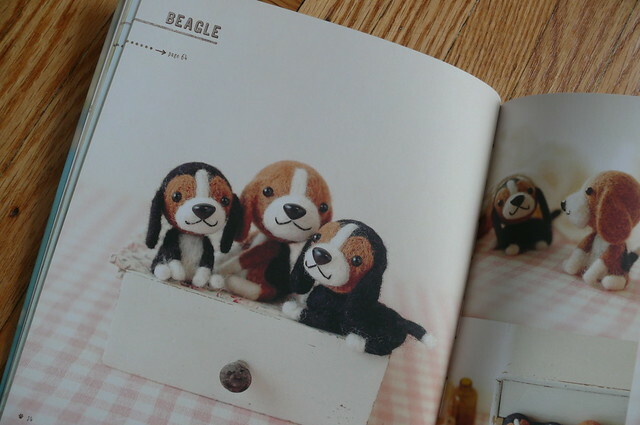 Beagles! I could see my daughter getting into this…. Very cute! 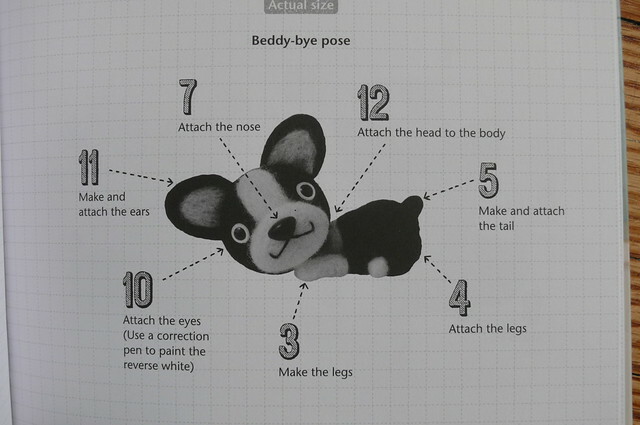 But I do love the un-felted puppy at the end the most. Cutest things ever! Every single photo. This has to be done by the same people as Crafting with Cat Fur – it looks so similar! Little bit creepy but amusing nonetheless. Please don’t enter me for the book, cute as it is, I am more of a cat person! Aw look at his little face. Too cute. All the doggies are adorable. 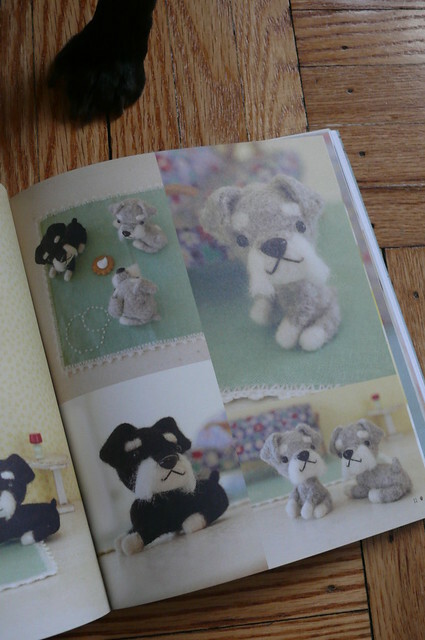 Should I feel bad that I want to felt little versions of my dogs so they can have their own little mini-me toys? HAha. MOAR DOUG THE PUG ERR’YDAY! That’s totally adorable. 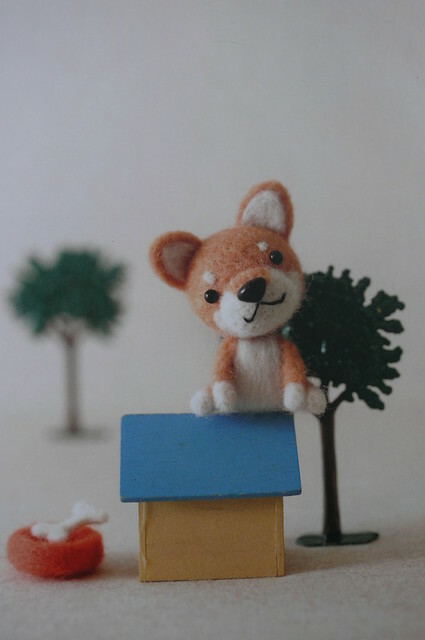 A friend just recommended I try needlefelting about three days ago! I guess I don’t have one specific favorite breed- I love corgis, but I’ve got friends with amazing huskies, and one with a boxer-mastiff mix. I DO like pitbulls, boxers, and bulldogs- nice jowly dogs. Hmm. I guess Jackapoo since that’s what my dog is. Pugs are super cute too! Thanks for the chance to win a copy. 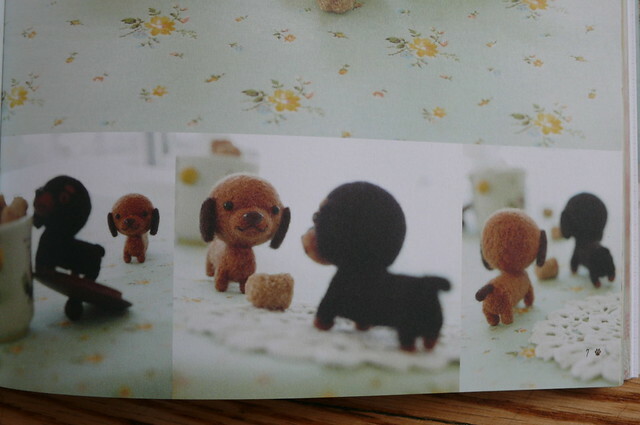 I have been wanting to try needle felting for ages, and these dogs are so cute now I just have to make one!! 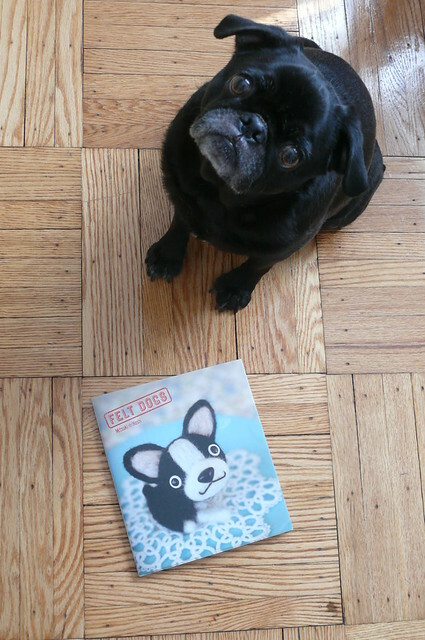 My favorite breed is terrier, but if I win I’ll make the pug first for my friend who is also a pug fanatic. Thanks for the chance to win a copy! If I win I promise to write my own review on my blog: threadscapes.blogspot.com. I love Boston terriers and boxers! I just bought pounds of roving so I’m ready to go. Sooooo cuuuuuuute!!! I love dogs, pretty much all of them. Although I’m partial to puggles, because that’s what I have. And he’s adorable. And so is your dog 🙂 This sounds like so much fun to learn how to do. Oh my god I want want want thaaat book! my favourite breed is no breed. I won´t ever spend any money in buying a dog, being so many abandoned poor babies. 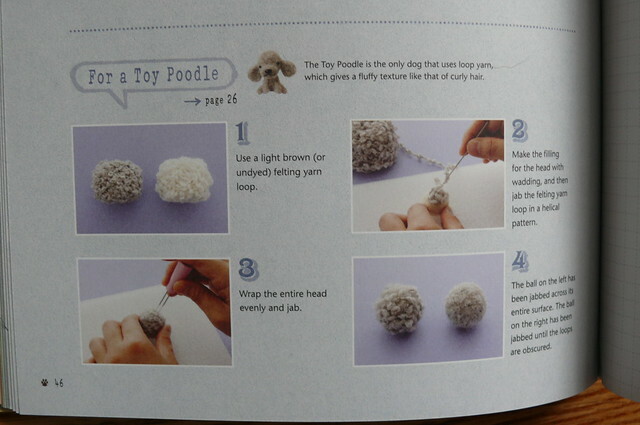 Don’t enter me into the draw (not eligible) but I wanted to say that my mother bought me a book called “Knit Your Own Dog” because she wanted me to knit her a westie. I’ve nearly finished crocheting her one instead. oh, so adorable, I’d love to be entered, this would be a great present for granddaughter. I would love this book. Thanks for sharing. Love that last photo: he’s like: Am I not cute enough? 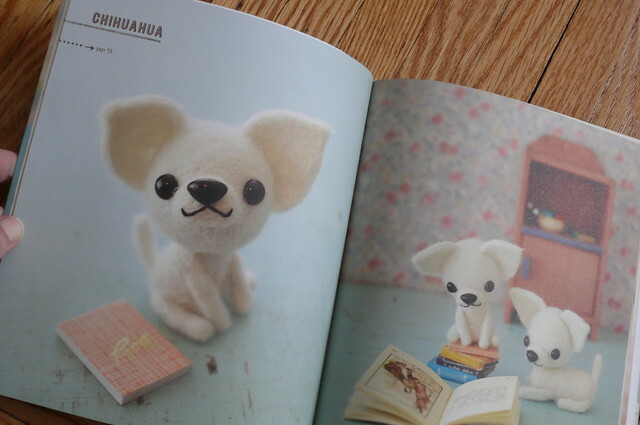 You have to go make tiny felt dogs?